Great day last Saturday for our Christmas “Fun Day”; great atmosphere, very friendly visitors and members. I hope those who attended went home with full bags full of goodies that will appear in future projects. The longer time meant shopping was a more leisurely affair and there was ample time to sit over a cuppa and chat with others. The cakes were delicious! The small workshops were enjoyable. Thank you to all those who organised and visited. One person absent was Val Heron. She is slowly improving after her strokes but was unable to attend. Her beloved Young Embroiderers is well catered for by Kathy Green and Mal Ralston is taking over the administration. Many members have offered workshops during the year; indeed Gill Roberts organised one last month. If you know of a young person between 7-17 years who has an interest in textiles do encourage she/he to join. I hope you all receive sewing goodies in your Christmas stocking and plenty of time to use them before our next meeting in January. Have a pleasant time however you celebrate this festival. Hoping to see you all in January. Most members will remember the agony we all suffered when the decision over whether we stayed in the national guild or went independent was being decided. Brexit has nothing on our deliberations! Members who attended the meeting outlining the pros and cons of leaving the Guild will remember that the complexities involving the bank account, insurance and room hire were just some of the reasons that starting the group independently was almost impossible. As a group, the majority elected to stay in the Guild, despite many members feeling that HQ fees are too high and not beneficial to our group. Part of the rules of the Guild is that people may attend a maximum of 3 meetings at the guest rate, and if they are interested in what we do, and want to attend more meetings, they then need to join as members paying the yearly fee. Some members, for a variety of reasons have decided to have a break in membership, and attend occasional meetings at the visitor rate. The committee would like to give the reminder that only 3 meetings are allowed at guest rate, after which we hope people will feel able to re-join the group as full fee paying members. Many members feel that the friendship and inspiration we get from our MEG group outweighs the fee we pay, and I hope you feel this too. All the members who contributed to our recent exhibition can be pleased with themselves. Visitors were very complimentary about the skills displayed and the variety of styles shown. We were visited by members of other regional branches, who stated their pleasure at the whole display. 40 of the North Wales branch came; the Lord Mayor spent nearly an hour one morning and the Regional Chair also visited. Many suggested the exhibition was moved to other venues, which was flattering but they had little idea at such logistics involved or the time the team spent on putting up. There is a positive plan to move to Sefton Park Palm House early next year but nothing is finalised. Having a theme that directed our minds so keenly with the associated ideas and visits to museums etc. obviously paid off. I am extremely proud of us all!! I hope you all attend the AGM on 20thOctober. The Committee won’t keep you long, but new blood is wanted as members can only serve for a certain time and new thoughts are always welcome. Some of us are planning to enjoy refreshments at the Maritime Museum. One visitor told me she’d been informed about our exhibition by a relative in Australia, so the journalist must have had some part of her article published. I’m still on the trail of the photographer! Will report back when anything comes up. One item I took from our July talk by Emma Sumner was the fact that the men in Bangladesh appeared frightened of the women’s ability to embroider. Cunning ladies, they were delaying their weddings until their dowry was decorated. The men were so cross that they outlawed embroidery! I’m sure the women have found away round this situation. I won’t bore you with my thoughts on men’s education but obviously our society does not carry such restrictions. The Australian publication, Inspirations, had 2 short items on the power of embroidery; one example from the Eastern Cape of South Africa where a stricken HIV riddled community channelled their anger into an art project based on Picasso’s Weeping women series. This was an outlet for their grief. The finished project is the same dimensions as Picasso’s picture, 3.5mx7.8m wide. It is called The Keiskamma Guernica. In Kandahar, Afghanistan, poor, illiterate and oppressed women have found hope to a new future through an embroidery scheme. Traditional Khamak embroidery is worked on male clothing, from birth to death. Girls learn the skill from a young age and women show their love, pride and honour in adorning their men’s clothing. The women learn empowerment by delivering high-quality work. Their manner of living may not be what we enjoy, financial independence, but using their skills they have made brave steps into the modern world. I’m often asked why I embroider! 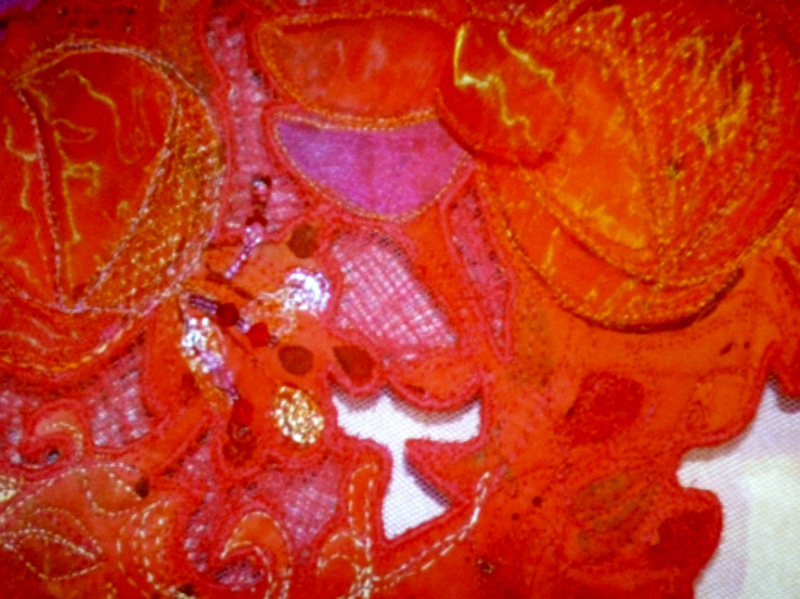 Luckily I do not suffer the restrictions of other societies; the comradeship of other embroiderers helps my stitching. Long may other groups continue! Long may our group continue with fellowship. I‘ve spent some time with my sister, catching up with family and working on a piece for our exhibition. Little relatives are growing fast. They are never short of energy and chatter eagerly like the sparrows. My aching legs have a job to keep up. It is refreshing to see the young develop. Our Butterfly frame is filling with the Stumpwork we worked in February. If you have framed your insect do bring to show in the Cathedral. There is also going to be the HEARTS display in September to October in the Memorial Chapel, so visitors will have two stitch exhibitions to see. If you can spare an hour or so to help hang the hearts on September 7 please get in touch. The organisers have asked our branch to help, as we are the local people. Many of you were keen on going out for afternoon tea once the exhibition is taken down. The Maritime Museum is rather fitting and the cakes aren’t bad either. If you want the full meal we need to book in advance, so please let me know at September meeting or before, I don’t mind. Just keep stitching! Some pieces of your work will be transferred to Sefton Park Palm House for display for a while. The period of time has to be decided with the curator. There are security personnel on duty. The sad news re Marie Stacey stunned many members. Her funeral is Monday August 6 at 2pm in Chester Crematorium. I hope the warm weather has helped you to sew; using natural light is such a boon! The sun appears to make my threads grow. Last meeting was a jolly affair with members appreciating Bolton’s talents and enjoying the variety of pieces. Our next meeting is with a local lady who has been living in Bangladesh and she is bringing native work for us to enjoy. Come and hear her. I also have 2 Folios from HQ for you to peruse. Recently I went to Lancaster with a friend and discovered the Catholic Cathedral houses 2 very old chasubles; they have obviously been remounted but the embroidery is fine. We were on our way to Poulton Le Fylde where the Catholic church, St Johns, has a late 15th century chasuble, which has undergone conservation and is displayed in a special cabinet. I had learned about the latter from a Cathedral verger but the first find was a great thrill. 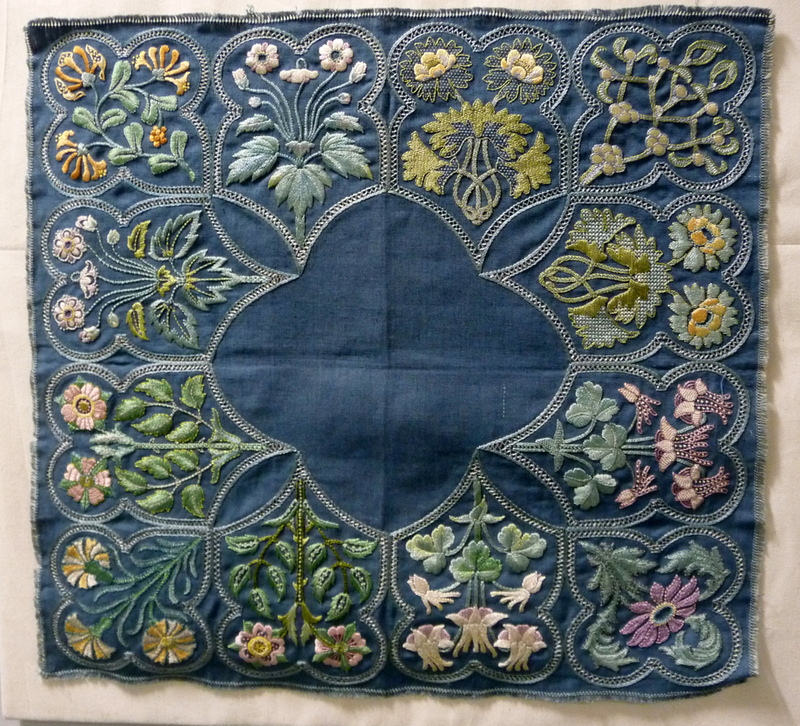 If you know of or come across pieces of old embroidery please pass on the information. Our hobby produces beautiful pieces, as have our predecessors, but these will not last for ever; they need appreciating and recording now. Many of you know I volunteer in our Cathedral Elizabeth Hoare Gallery, which contains textiles made before 1910 and a cabinet full of East Grinstead work. If you have not visited there why not combine a visit when you are viewing our exhibition. Some members went to a lecture at the Maritime Museum to hear an expert on Cook’s voyages explain about the Liverpool connection. One officer named Molineaux was in the crew as Master and he was born in Liverpool before joining the Royal Navy. We were very pleased to learn a local sailor was involved. We’ve had a long gap between meetings so I hope to see many of you on 16 06.18. The “official” forms from HQ may appear complicated but do not worry, they are for our benefit. We all require protection, which is what this exercise is all about. Gill has put out a call for all blackwork pieces, which she will display in July. She’ll have quite a job putting them together on the cloak. The Exhibition is not far off. I hope all your pieces are coming together. We’re asking for completed pieces to be bought into our September meeting. Also keep in mind we’d like as many members as possible to take a turn stewarding during our show. I’ve managed to complete a second piece. It is now in the framers! Hurray! If you are stuck for ideas, have a look at our book reviews, where there is a book on Maori decorations and patterns; this was reviewed a while ago by Elsie. This should help anyone who has hit the “lack of inspiration” wall. I’m now on the butterfly we began at a workshop, to display in the large frame as if in a flowery forest; that’s the idea, have to see if I can pull it off. Do you have ideas but not certain how to execute them? That is where discussing them with friends and perhaps more experienced members helps. Come early to our next meeting and do just that. Remember the colour competition also this month. Let’s show Bolton our talents! The Regional Day was enjoyable, well organised and an inspirational day, with an entertaining speaker after lunch and plenty of shopping/socialising time before. It was good to meet up with old friends and new; some of the members from Bolton, who are visiting us next month, introduced themselves. The exchange of ideas and methods that we began some years back seems to have spread around the region; it is a great way of spreading good practice. No branch has come forward to organise next year’s Regional Day, but your branch will be organising 2020! The venue will be L.A.C.E. in Sefton Park; you may be familiar with this as it popular with many events. This venue is easily reached by public transport and road. The date for your diary is 25th April 2020. The Young Embroiderers scooped the board at the regional Day, as I hope you’ve seen from the report on the web, winning 3 prizes, so Merseyside goes on the trophy again. Many congratulations to the girls and Val their leader. Young stitchers will carry the banner for sewing into the future and help to keep the Guild knowledge alive. This is very important for the whole Guild; an increase in membership is paramount, not just maintaining our numbers. Perhaps you know someone you could invite along for a taster at one of our meetings. Sadly we have cancelled May’s meeting, as our date clashed with an important wedding. Our plans for that meeting will appear in December. I do hope your pieces are growing for the Endeavour Exhibition. We appear to be ahead of other displays of Cook and his travels; I’m not surprised, it often occurs in this region! Other branches have exhibitions to celebrate their age, we like to celebrate famous people from history. Do come along early in June; hopefully there will be a visitor from India with some of her beautiful work. Bring along your piece and stitch in company. Last year our branch voted to remain in the Embroiderers’ Guild. Two weeks ago we were visited by our CEO, Mr Terry Murphy. Those members who attended this meeting were very polite, receiving long answers to questions but many felt there was no substance. HQ appears to have many ideas but does not send out information until near the cut-off date. Our branch needs to take notice of what HQ is planning, even if we don’t join in. Two of our members are participating in the Hearts project. Well done, ladies! At Regional level four members are attending the NW Regional Day at Leyland. Travel maybe one reason why more of us do not attend- I still have 1 vacant seat in the car, contact me if you are interested – and find out what the area is planning. The date is Saturday April 21st . Cancelling the May meeting was discussed at length by your committee. May19th is Royal wedding day and we did not want to stop people viewing it. Events planned for the Spring will now take place in December, when it is hoped more members will turn out than last year. I did ask for suggestions from members about our more social events but none came; I presume people are satisfied with how the programme is planned. If you are not, please contact me at the address on this website. Nothing is set in stone. We all need a change. I recently caught a TV series entitled “Crafts”, showing different hobbies being tried for the first time by complete beginners. The film from Hampton Court, RSN, seemed simplistic and offered little guidance. The finished pieces varied according to the participants’ imaginations. It seemed shameful that people eager to learn a needle skill were not offered a more exacting type. I wonder how much of each programme is never shown!? Spring is beginning to show even if snow has appeared. Luckily we have a dusting but not enough to stop us. Recently Val and I received an invitation to collect sewing items from a long time member who had passed away. Her name was Mabel Laine and she was well known for her work in numerous churches. We came away with a box of items that I hope will inspire many of us. It will appear on the sales table soon. I also discovered she came from a family that had run a shop near the Black Horse on Prescot Road for many years, which is quite near where I dwell. Amazing how small the world seems when you get talking with people. David Peglar remembered Mabel with much affection, as she helped him with his City and Guild cope when he studied at Newsham Centre. I’ve recently heard that that centre will be closing later this year. There are few such places left in the city. Crafts need the personal touch and encouragement; it’s not always the best method of learning via the internet or post. We find newcomers progress best when attending our Stitch and Natter sessions or even a workshop. The most recent workshop was a jolly day, everyone sewing like fury but I think the butterflies will not hatch for a while. I’m hoping we’ll have a good display in the Exhibition. 20 people have paid up for the trip to NEC on March 18. I have 1 spare ticket if anyone wishes to join us. Give me a bell. I’ve seen daffodils blooming and the grey days are shortening, soon Spring will be with us. It is hard to settle to stitching in the short days but now my interest has been revised. Our first meeting of the year always stimulates and our speaker certainly did! What glorious colours! I hope you all enjoyed your museum visit, what a marvellous collection to inspire us for the exhibition. We owe many thanks to Kim for organising these visits. The exhibition we are planning appears to be stimulating other groups; The Cook Society has a lecture at the Maritime Museum on June 23, given by Steve Randnall. Records show that a Liverpudlian was in the crew, which certainly brings in the local interest. Should be a fascinating talk. Posters will be soon be available for people to distribute so keep your eyes peeled for windows suitable for display. Your committee is always looking ahead; one event is the Open Day in May. With this in mind please bring to our next meetings good items you can donate to the Tombola stall. We will require a varied selection to help our funds, so find the Christmas gifts already pushed to the back of the cupboard. Can you remember the New Year? This time I was with my sister and friends so there was much chat and laughter. I just wish the motorway as happy on my return journey! I hope everyone enjoyed their holiday with family and friends. 2018 is our year to celebrate Cook’s first voyage to Tahiti and other romantic sounding destinations. I hope your pieces are growing. If you are not sure of how to finish off, bring it to our next meeting; Val is giving a master class in lacing and the best type of frame. This year commemorates the universal suffrage movement so let us do our best to remember the feisty women who led the way and gave the rights to all for work and play. Only our personal limitations hold us back, so stretch your talents when thinking of your next project. Friends are always willing to offer advice; perhaps their stash bag has just the colour you need! I’m about to begin my second piece, with a lot of help from a friend. Good luck in all your endeavours! First I wish you all a good happy Christmas with those you love. Enjoy seeing in the New Year in whatever manner suits you best. I prefer an early night with a good book nowadays although I can remember seeing in the New Year in Edinburgh with appropriate singing and dancing. I find it amazing that we’ve almost lived through 2 decades of the 21st century! Where ever you see it in may the future bring you happiness and peace. The Christmas Party had much to recommend although the lack of members was rather depressing. Those loyal people who did support the branch were very generous and branch funds have benefited. I do hope you will find time to work at your pieces for the Endeavour exhibition. I know how quickly time passes and ideas haven’t even reached the material stage. Ideas are running round in my head but putting them into reality needs time to sit and think. Do come to our first meeting in January and bring pieces to show. Val will demonstrate how to lace finished pieces and the type of hanging required. Also that day you are asked to come wearing black so our speaker can use us for demonstrating her style of weaving. She comes highly recommended by Wirral branch. Following on our vote to stay with the Embroiderers’ Guild the CEO, Terry Murphy, has expressed interest in meeting us and other NW members. Kim is busy sorting a date so watch the website for more details. He is prepared to answer questions submitted beforehand. This should make an interesting session. We should also be visiting the Museum for our behind the scenes sessions next month. I know Kim nearly filled the 3 bookings she has organised with the World Museum. Do contact her if you missed out on a date. Our vote earlier in the year proved that members wish to stay affiliated to the Embroiderers’ Guild, an association that gives us contacts nationwide; this means we can visit branches when on holiday around the country. Give it a try and join another group of like-minded people and see what they do. All the branches are listed on HQ website and I have found people welcoming and interesting. Our recent visit to the North Wales exhibition showed the talent that exists nationwide. The scheme our branch began a few years back of exchanging visits also lets us share ideas and inspirations. Do use H.Q.’s website, you just need your membership number, then you can see what is being planned nationwide and in the regions. The Annual Stitch Day is held in the summer and is a jolly occasion. Although Merseyside has not participated every year I’m hoping we can next year, to publicise our forthcoming exhibition. If you hear of an event in the region that concerns stitch or textile please send details to Hilary for inclusion on our web site. Do run-off a copy of the Party Poster and display in your local church/centre/shops. Encourage friends and family to come along. We have found that personal invitations can lead to membership; your branch requires new members to keep it viable. If anyone can donate a suitable unwrapped gift for the Raffle, Val and I will be grateful; we are running this activity at the Party. Anyone willing to help at the Party will always be welcome. See you then!